HCF, Australia’s leading not-for-profit health fund, approached End of Work to create brand experiences to connect the brand with customers in rural areas. First up, End of Work suggested a larger partnership with this year’s Lismore Show and to offer a fully interactive, digital experience for show-goers. End of Work conceived HCF’s Health and Lifestyle Pavilion. 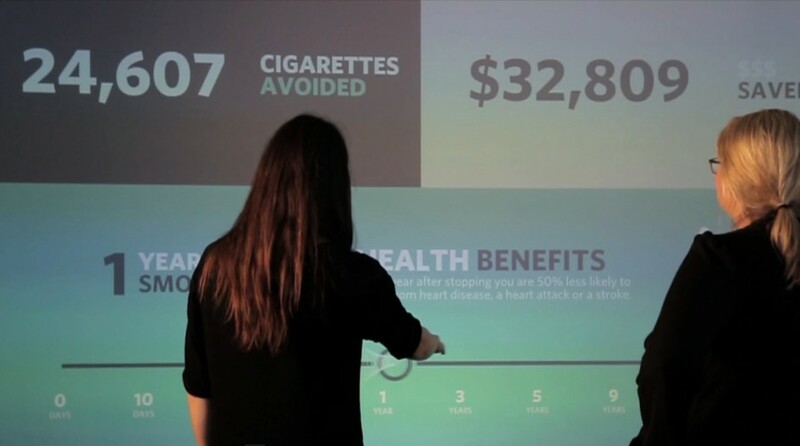 Which featured oversized interactive motion screens for the community to interact with. With Displayground we created pioneering, immersive digital displays that made the storytelling of the HCF brand even more powerful. The interactive motion screens enabled users to take quizzes and do activities on fitness, mental health and quitting smoking, all while learning about their own health and the available tools that HCF offers members. The Pavilion was hosted by former B105 Brisbane radio presenter, Peter Buckley, and qualified personal trainers were on hand to answer any questions from visitors. End of Work also created ‘Bike-n-Blend’ juice stations, where adults and children can peddle to blend their own juices. The stations offered a virtual experience, where visitors could plug their phones into virtual reality glasses to watch videos. And four HCF ‘Shade Pod’ chill-out zones spread out across the showgrounds, offering visitors a cool place to rest in between the festivities of the day. See the case study film here.